absolutely tabulous Each of the four Tab Board Books from DK's SnapShot imprint offers a visual table of contents: a row of illustrated tabs down the right side of each book presents the theme for each page. 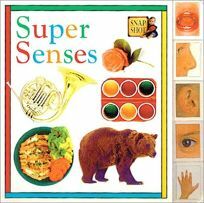 The tabs of Super Senses, for example, show body parts to represent the five senses. Within, spreads contain photos of related objects, each labeled with a single word. Other titles include Let's Go Shopping; Animal Families; and Things That Grow.